Meet and mingle with Portland Business Alliance members at this popular monthly networking event. We’ve received limited free spots for Greater Brooklyn Business Association Members. Food, beverages and a one of a kind factory tour are included. More info available from the Portland Alliance here. If you’ve not seen the Bullseye factory, don’t miss this chance! In the summer of 1974, three recent art school graduates set up a glass factory in Portland’s SE Brooklyn industrial neighborhood. 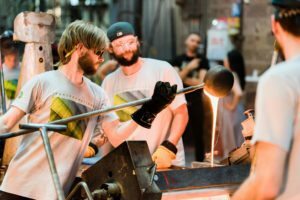 Working with artists from around the world, they developed a new kind of art glass. Now, 44 years later, Bullseye continues to work hand-in-hand with artists and schools internationally to expand the technical, aesthetic, and conceptual possibilities of art glass. ****A RSVP & current paid GBBA membership is required.